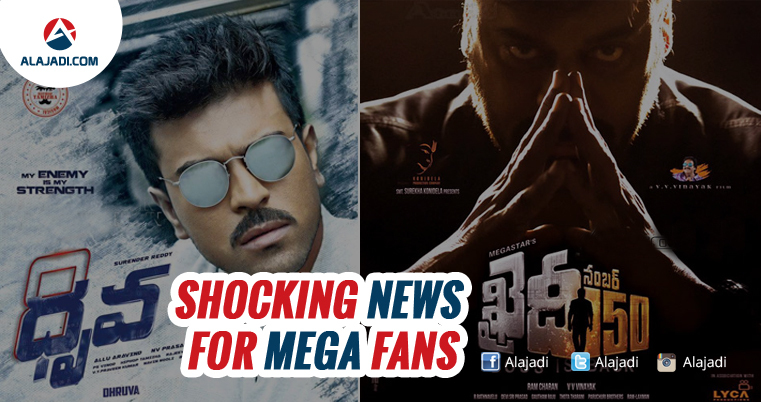 » Mega Shock – Dhruva and Khaidi Postponed? The impact of old currency ban was so serious on Tollywood films too. The unprecedented sudden decision by Modi went in so serious where the biggest upcoming projects. Millions of mega fans are currently waiting for the release of Ram Charan’s Dhruva and Megastar Chiranjeevi’s Khaidi No 150, which are slated to hit screens in December and for Sankranthi respectively. However, as per the latest reports emerging form Film Nagar, both the movies will be pushed back in the wake of the empty theaters following the decision of the govt. to ban the high denomination currency notes. Until yesterday, it was speculated that Dhruva would release December 9. And now, rumours have been rife that the movie may be put off to Sankrnathi to overcome problem of scarcity of currency notes with the people. Similarly Khaidi Number 150 is rumoured to be deferring to summer in lieu of Sankranthi. This rumour really shocks the movie patrons. Let’s wish the makers of both Dhruva and Khaidi Number 150 should give clarity on the release dates of both the films soon. Baahubali, Katamarayudu, DJ and Mahesh’s film are some of the biggies which are already in summer race.